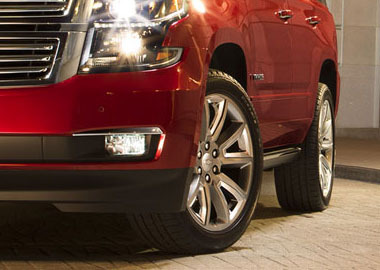 Tahoe features a 5.3L EcoTec3 V8 engine designed to generate the power you need. Why settle for performance or efficiency when you can have both? 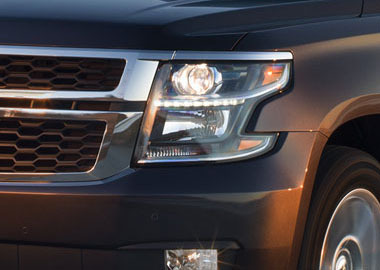 Projector-beam headlamps and HD LED taillamps on Tahoe LS. Standard on Premier and available on LT, the handsfree programmable power liftgate ensures you’ll worry less about the liftgate being out of your reach. 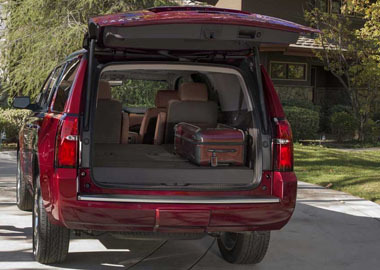 A sensor under the rear bumper allows you to open the liftgate with a gentle kicking motion. The 8-inch diagonal color touch-screen slides up to reveal a password-protected area behind the display with space for cell phones, wallets or other valuables. Additionally, a USB port1 gives you one more place to charge your devices. The conveniently placed buttons allow Tahoe with power-release second-row seats and power-folding third-row seats to go from passenger space to cargo space in no time. Standard on Premier and available on LT.
Cabin refinements — like an acoustic-laminated windshield and inlaid doors with triple seals — help reduce outside noise to make Tahoe your quiet sanctuary from the outside world. The available Rear-Seat Blu-ray® Entertainment System lets rear-seat passengers enjoy every drive with their favorite movies. With a new HDMI connection and Wi-Fi®5 it’s possible to project to the screen from your mobile devices. With as many as 14 charging locations, including an available wireless charging pad2 and up to seven USB ports3 to connect phones, tablets and other portable devices, you’ll always be able to stay in touch with your world. As your comprehensive owner benefit program, Chevrolet Complete Care ensures our commitment to owner satisfaction for all 201\7 Chevrolet vehicles.